A skate park, a contemporary new housing development, student accommodation and several conservation projects took the top honours last night at the 2018 York Design Awards as the best of the city’s architecture once again took centre stage. The 2018 award winners were announced at the annual presentation evening held this year at the Ron Cooke Hub at the University of York which was attended by more than 150 property professionals. A new award for 2018 was the Sustainability Award, which went to The Granary in Fulford. This is a conservation-led, self-build conversion of 19th century farm buildings into the office of Native Architects, an environmentally-sensitive local architectural practice. The main building is a typical two-storey granary with external stone steps giving access to the upper floor. Yorkshire grown, construction-grade hemp was cast against the solid brick walls for thermal insulation. Extensive use has been made of recycled plywood sheets which could have otherwise gone to waste. The judges praised the building for its “exemplary use of low carbon design techniques throughout” and the “brave and inventive reuse of a redundant former granary building to provide new employment space.” The Granary also won the Commercial category. The Chocolate Works Care Village on Bishopthorpe Road won The Press People’s Award, voted by local residents and readers of the York Press. The former head office building of the Grade II listed Terry’s Chocolate factory has been converted into a residential care village featuring shops, hair salon, coffee shop, cinema and even a pub! present and future significance of the building, and the display of one of the largest Civic Collections of gold and silver in England. The works included the removal of intrusive past additions, the enhancement of original features including the functioning 18th century kitchen, major structural repairs, a climate control system and greatly improved fire safety. Other winners included the restoration of the Great East Window at York Minster, the Red Tower on Foss Islands Road which has been transformed into a café and community hub, and the sympathetic refurbishment and transformation of a Regency villa and former hotel, into a family home. 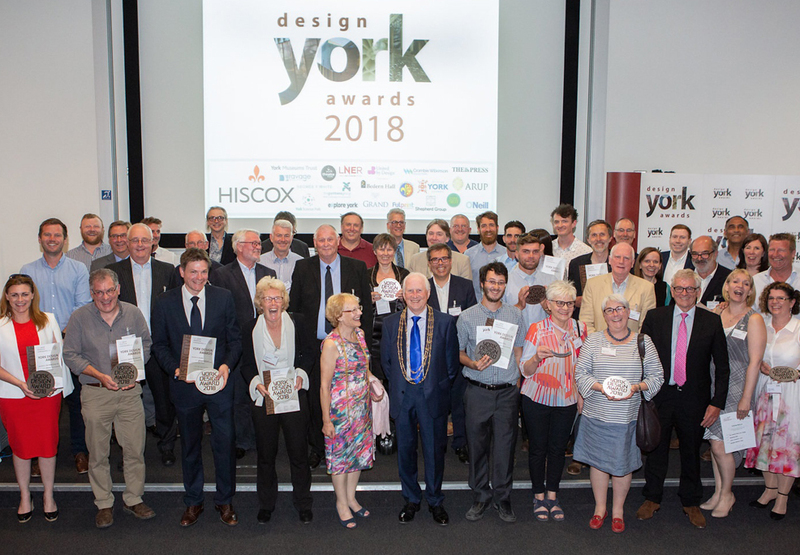 Chair of the York Design Awards committee Janet Hopton said: “Congratulations to all our 2018 award winners. We were delighted with the quality of the entries once again this year, which presented our judging panel with a tough challenge deciding which projects should take the honours. Celebrating its 12th anniversary this year, the York Design Awards launches every January with entries submitted between January and April. The awards are organised by a committee of volunteers and all funding is provided through sponsorship, including from main sponsor Hiscox. Other additional high-profile sponsors include Arup, Bedern Hall Foundation, CG Building and Restoration, City of York Council, Crombie Wilkinson, Fulprint, George F White, Leeds Environmental Design Associates (LEDA), LNER, O’Neill Associates, Ravage Productions, Shepherd Group, The Grand Hotel, The Partners Group, The Press, United By Design, University of York, York Architectural Association, York Civic Trust, York Conservation Trust, York Explore, York Guild of Building, York Science Park and York Theatre Royal.